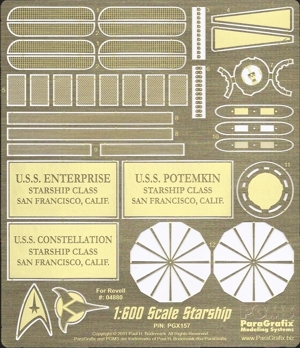 Upgrade the details for Revell of Germany’s new USS Enterprise starship kit. Pre-Smithsonian-renovation-accurate grillwork for the warp engines and pylons (slightly rescaled, but to the original proportions). Through holes are provided for those builders who want to light the engine grills. Three versions of the impulse engine exhaust (solid, lightable, and “grilled”). The exhausts are proportioned to the filming miniature rather than the Revell kit. Two different versions of the “bussard collector” clamps. Dedication plaques, accurate to the series’ bridge set and sized to fit on the display stand. Names match the three sets of decals included with the kit. Even an in-scale bridge! The bridge’s base is designed so that lighting (if included by the builder) shines into the bridge at the locations of the display screens.